Handwriting can be tricky to teach. Sometimes it must be done 1:1 with students, and it requires rigorous, thorough practice and follow through. Some teachers and administrators will tell you that handwriting really isn’t important, but I beg to differ. In kindergarten and first grade, we are learning how to read and write. By second or third grade, the focus becomes writing and reading to learn content . 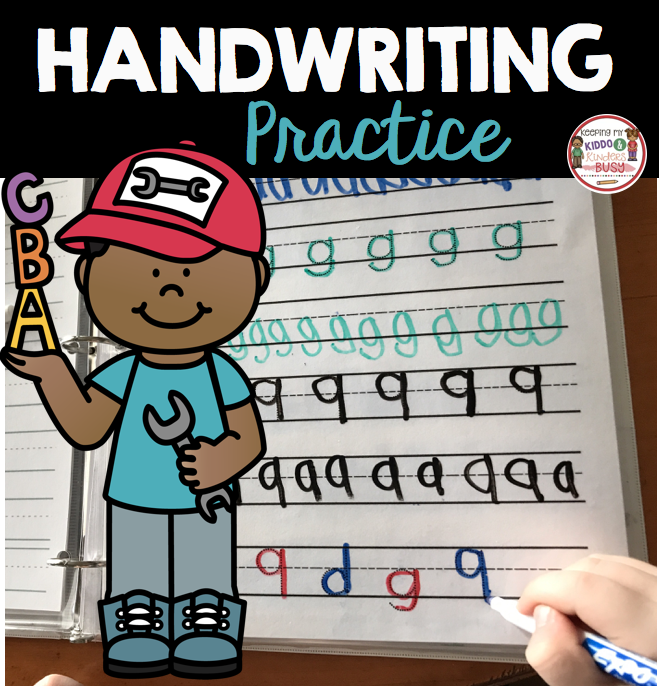 I have also taught the upper grades, and when students do not form their letters correctly, it takes them longer to write and it is hard to read what they write. Plus, they are sometimes more focused on the act of actually writing and forming their letters rather than their content. The entire writing process becomes frustrating and overwhelming for them. One reason it is so important to start off on the right foot with writing is that to un-teach a child bad habits can be almost impossible. I read an article one time that said to “unteach and reteach” a bad writing habit (like forming a letter the wrong way) the child will have to write a letter the correct way over 100 times to make it a new habit. Wow! This is why in my FREE Morning Work Packs I do not have children tracing letters until later in the fall AFTER I teach them the correct way to write. At the very beginning of the year, I only have them match and identify letters to save me a headache later! Over the years I have come up with a few tips and tricks for helping students become successful little writers. I teach letters in “groups” that have similar formation. This has worked so well for my kiddos, and I hope you enjoy these worksheets as much as we do. 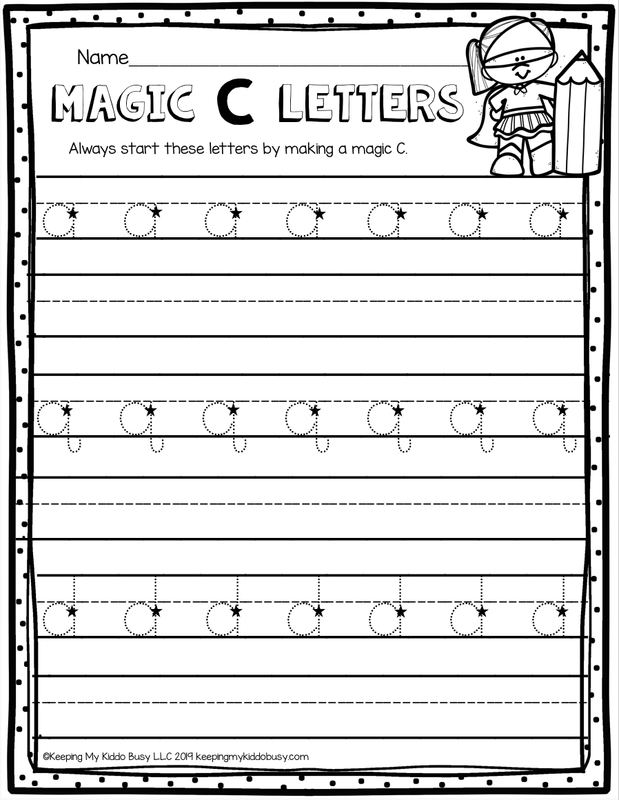 For example, I teach letter C and then once students have mastered C, I teach them the letters that start with making a “magic c” such as lowercase a, lowercase g, lowercase d and lowercase q. Their hand/brain connection remembers that movement of the magic c so it becomes ingrained in their handwriting. A froggy jump is when you have to actually pick up your pencil and move it while writing a letter. There are lots of froggy jump letters, especially with capital letters such as A, H, P, R, T, K, D, etc. For some reason, I have noticed over the years that letter P is easy for children to write. So I like to start with P (it is also a really easy sound for them to remember /p/). The next natural letter for them to learn is B, because it is just a continuation of P.
R is next and it is a little trickier, but if they already have P down it isn’t too bad. Are your littles feeling squirrelly? Have them do a push up and get ready for the next few letters! Their pencils should not leave the paper until their letter is complete. These letters include lowercase r, n and m.
Big line down letters are just that … big lines that go straight down. We start at the top and fall straight down all the way until we bump that bottom line. The obvious one to start with is lowercase l.
Then we move on to lowercase h. If they already have the language and motion of “pushing up” they can get this letter super quick. I will be adding more soon! If you have specific requests, please be sure and let me know! These worksheets are FREE in my Exclusive Freebie Library. I hope you enjoy these worksheets as much as we do!